"Katanning" redirects here. It is not to be confused with Kittanning (disambiguation). The meaning of Katanning is unknown but it is thought to be a local Aboriginal word that is 'Kart-annin' that literally means "meeting place of the heads of tribes", 'Kartanup' that means "clear pool of sweet water", or 'Katanning', which means "spiders on your back". Others suggest that the place is named after a local Aboriginal woman. The first Europeans to explore the Katanning area were Governor James Stirling and Surveyor General John Septimus Roe who travelled through the area in 1835 en route from Perth to Albany. In about 1870, sandalwood cutters moved into the area but they did not settle. It was not until the development of the Great Southern Railway, a land grant railway built by the West Australian Land Company from Beverley to Albany in 1889, that the township came into existence. The townsite was initially developed by the West Australian Land Company. The state government purchased the railway and the townsite in 1896 and later formally gazetted the town in 1898, when the population of the town was 226, 107 males and 119 females. In April 1891 the Premier Roller Flour Mill was opened in the centre of the town by brothers Frederick Henry Piesse and Charles Austin Piesse. The mill provided an important cash market for local wheat growers. Initially the mill supplied flour to the whole of the Albany district, replacing more expensive imports from Adelaide. At that time Albany was Western Australia's principal port. The mill is being converted into a hotel-restauarant complex, due to open in 2018. Katanning remains an important centre on the Great Southern Railway to Albany. Katanning sits on the border between the warm-summer and the purely subtropical mediterranean varieties with January and February being just below 22 °C (72 °F). Under the Köppen climate classification it is classified as Csb. A statue of Frederick Henry Piesse (by sculptor Pietro Porcelli) was erected in 1916 and stands beside the railway line in Austral Terrace. The Piesse family constructed a regal mansion which was named "Kobeelya" and after being used for many years as a girls' boarding school, is now a conference centre managed by the local Baptist church. 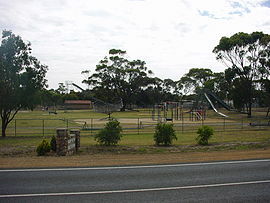 Katanning features a unique playground of oversized structures named the "All Ages Playground". The town has many other attractions, including a state of the art recreation, leisure and function centre. Katanning has a relatively large Muslim population, of about 350 people, and consequently has a mosque. The vast majority of local Muslims originated in the Cocos (Keeling) Islands, and travelled to Katanning to work in the local abattoir, which was established in the late 1970s. Other religious buildings include churches from Anglican, Baptist, Catholic, Lutheran, Seventh Day Adventist, Uniting, and Wesleyan denominations, along with a Jehovah's Witness Kingdom Hall. The town has a castle-like structure which was built as a winery. The town's entrance features an antique truck loaded with imitation wool bales, a windmill, and several sculptures of sheep made from corrugated iron. The town has become a regional service centre for the Great Southern and services the nearby towns of Broomehill, Tambellup and Woodanilling plus several more. Katanning railway station has an elevation of 1,024 feet (312 m) above sea level and a rail distance of 225 miles (362 km) from Perth. Kevin O'Halloran, gold medallist in the 4 × 200 m freestyle relay at the 1956 Summer Olympics in Melbourne was born and raised in nearby Kojonup, and the pool is named after him. Percy Gratwick, posthumous Victoria Cross recipient in World War II was born in Katanning. Lydia Williams, Football Goalkeeper for the Westfield Matildas, Australian Women's National Football Team. Alan Quartermaine, WAFL Footballer for East Perth, Sandover Medallist 1972. ^ a b Australian Bureau of Statistics (27 June 2017). "Katanning (State Suburb)". 2016 Census QuickStats. Retrieved 5 April 2018. ^ Western Australian Land Information Authority. "History of country town names – K". Retrieved 2008-08-16. ^ "SMH Travel - Katanning". The Sydney Morning Herald. 2004-02-08. Retrieved 2008-08-16. ^ Bindon, Peter; Chadwick, Ross (2011). A Nyoongar wordlist : from the south-west of Western Australia / compiled and edited by Peter Bindon and Ross Chadwick. Welshpool, W.A: Western Australian Museum. ISBN 9781920843595. ^ "BHP Skills.net - Katanning". 2006. Archived from the original on 17 March 2012. Retrieved 16 August 2008. ^ "Population of Western Australia". Western Mail. Perth, Western Australia: National Library of Australia. 22 April 1898. p. 23. Retrieved 6 April 2013. ^ "News and notes". The West Australian. Perth, WA. 25 April 1891. p. 3. Retrieved 20 March 2018. ^ "Register of Heritage Places - Katanning Roller Flour Mill" (PDF). 1994. Retrieved 2008-08-16. ^ "News and Notes". The West Australian. Perth, WA. 9 May 1891. p. 3. Retrieved 20 March 2018. ^ Sandalova, Sjanna (14 February 2018). "Jobs boost as staff sought for hotel". The West Australian. Perth, WA. Retrieved 20 March 2018. ^ "Climate statistics for Katanning". Bureau of Meteorology. Retrieved 2 September 2014. ^ "Climate statistics for Katanning Comparison". Bureau of Meteorology. Retrieved 2 September 2015.